"The wind wiped away our footprints. When the storm had passed, we found something shining beneath the sand..."
Mars is the fourth planet in the Solar System, and the third largest terrestrial planet. Since the Collapse, much of Mars has returned to the desolation that came before the Traveler. Like the rest of the planets in the system, the red planet is littered with ruins from the Golden Age. It is home to Rasputin. It is also a living consciousness, and one of the Nine. A harsh and deadly environment, Mars is now a desert world frequently plagued by dust storms. The Cabal forces have a presence on the planet in the form of their Exclusion Zone, as do the Vex, who are at odds with the Cabal. An indelible sign of the Cabal presence on Mars is the moon of Phobos, which has had its orbit dramatically altered by Cabal planetary engineering; it now fills a significant part of the sky. Even more disturbing is the discovery of large "planet-cracking" munitions among the Cabal's already devastating arms. There is some degree of conflict as humanity tries to reclaim its former glory. With the coming of the Traveler, rain washed over Mars, and it was here that humans first encountered the spherical entity. Once, populating Mars had been nothing more than a dream for humanity, but after its terraforming, a thriving metropolis named Freehold came to dominate the skyline - a bastion of human life in the red dunes. With the coming of the Darkness, nearly all of the city was "swept away" and the sand claimed what remained. Today, Freehold lies buried beneath a mountain of sand, and its once-soaring skyscrapers are only visible. 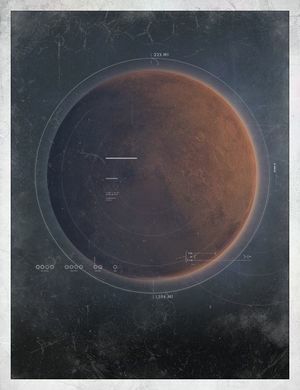 Mars was once ruled by the Awoken. When the Red Legion arrived in Sol, breaking the Cabal-Vex stalemate was one of its priorities. The Vex are hard-pressed and have lost multiple gates, including the Black Garden gate. The whole of Meridian Bay is now under total Red Legion control. A newly discovered icy region of Mars known as the Hellas Basin, a source of Warmind technology, has been overtaken by the Hive, who now prowl the region with an unknown intent. The Exclusion Zone guarded by Cabal. A Cabal Colossus on Mars. A postcard of Freehold during the Golden Age.